Thus Ernest Hemingway wrote off the town where he spent numerous holidays drinking the local wine and carousing at corridas, no doubt disappointing many of Ronda’s proud residents with his puzzlingly lacklustre review. Most of today’s travellers – including Britain’s prime minister and an American First Lady – would certainly disagree with him. Ronda has been crowned Andalucia’s third most-visited town and it’s not hard to see why. 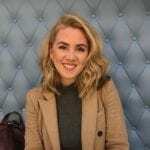 Ramsay, Kristin Scott Thomas and Spain’s ex-premier Mariano Rajoy have all stayed at the grand Hotel Catalonia Reina Victoria or the Parador de Ronda hotel. and discovering the Moorish dynasty with her daughter Sasha. Celebrity chef Jean Christophe Novelli went house hunting in the town after falling in love with it in 2009. With its spectacular high sierra setting, leafy parks, cobbled lanes and atmospheric ventas it’s no wonder Ronda has stolen the hearts of so many travellers. Over the centuries a slew of writers have waxed lyrical about its timeless character, stunning views and charming locals. for his noble matador in The Sun Also Rises; while the fierce rivalry between Luis Miguel Dominguin and Antonio Ordonez, the city’s other most famous bullfighter, is chronicled in The Dangerous Summer. But it seems the good people of Ronda overlooked the Nobel Prize-winning author’s slight on their hood. 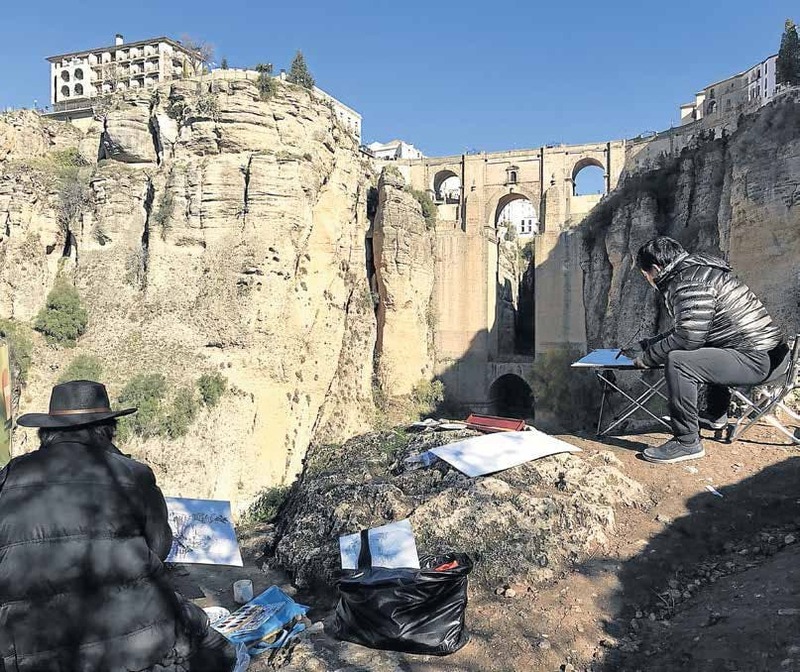 Instead, they paid homage to him with the Paseo de Ernest Hemingway, a pathway that teeters along the top of Ronda’s crown jewel – El Tajo gorge – which offers up gorge-ous views across Sierra de las Nieves National Park. 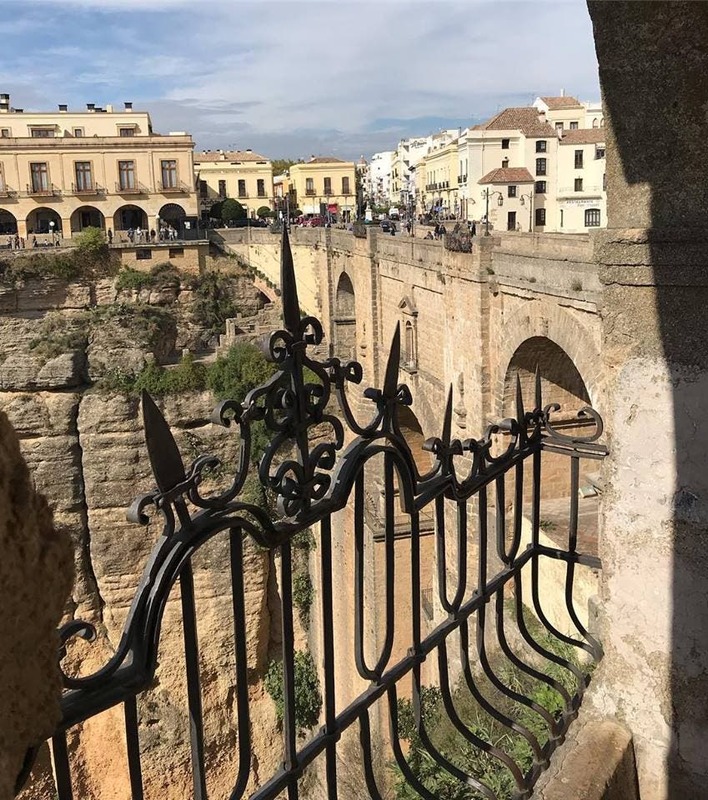 This 120-metre-deep chasm slicing the city in two is bridged by Ronda’s most photographed structure. The magnificent Puente Nuevo is anything but new, having been completed in 1793. As you cross the cloud-touching bridge, it’s like stepping into a medieval fairytale. The backdrop of soaring mountains crowned with traditional Andalucian white villages is equally dramatic. town of Mercadillo with the old quarter, La Ciudad. A chamber above the bridge’s central arch was used as a prison during the Spanish Civil War. Legend has it that Republican and Nationalist prisoners were tortured and thrown from the windows to the deadly rocks below. Later it housed a bar, today it’s a museum dedicated to the history of the bridge and its skyscraper jail. access the scenic walking routes from either side of the bridge. Take the old town side for a more challenging hike or the new town side for the easier route. Ronda’s bullring, poised between new town and old, also gets huge amounts of attention for being the oldest and most beautiful in Spain. There’s a museum inside and you can take a tour. 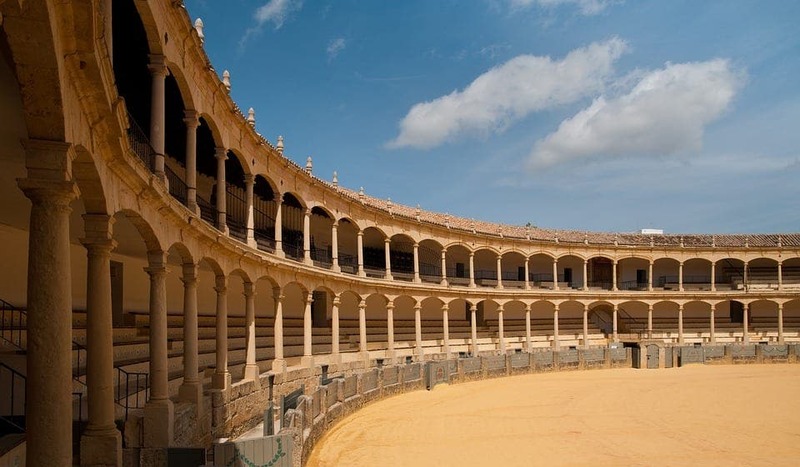 Despite bullfighting’s waning popularity, this famous arena is mobbed in September for the annual Goyesca bullfights, a homage to Ronda’s two most famous matadors and the Spanish artist Goya. 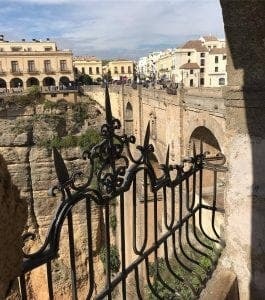 Ronda is a tale of two cities. Its old and new towns each have their own distinctive styles with Roman and Moorish influences. Built in 9 BC, it’s one of Spain’s most historic settlements and was a key military bastion in the Roman Empire. A stroll around the immaculate chambers, arches and columns conjures up images of the lavish lifestyle enjoyed by travellers in what was then the Kingdom of Granada. A fantastic reconstruction film brings it all to life. Another Moorish highlight is the Casa del Rey Moro, the palace where Michelle Obama surprised onlookers in 2010 when she descended the 300 perilous steps down to La Mina – the water mine – an experience many tourists choose to pass on. up containers of water from the river Guadalevin. 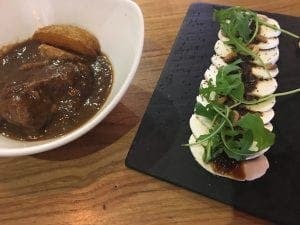 infinite places to stop off for churros and chocolate or Ronda cheeses and wine. Another way to explore Ronda is via its exquisite wine tours. Since Phoenician and ancient Grecian times, wine has been produced here and probably transported to the great cities of the Roman Empire. Take a visit to any of the 20 or more bodegas and you’ll be filled in well. If you’re spending more than a couple of days in Ronda, the cave art at the Cueva de la Pileta is another must-see. Nestled in the village of Benaojan some 20 kilometres southwest of the city, the belly of the cave reveals Stone Age paintings of horses, goats and fish which can be marvelled at by torchlight with a guide. A trip to Ronda, whether it be for a day, a week or even a year has the uncanny ability to transport any visitor to another time and era. If you’re reading this up there, Mr Hemingway, we think you should eat your words.